What are the five conditions that any type of brain training, from meditation to technology-based options, must meet in order to transfer into meaningful life benefits? In a modern society we are confronted with a wide range of increasingly abstract and interconnected problems. Successfully dealing with such an environment requires a highly fit brain, capable of “reading” and adapting to new situations and challenges throughout life. Consequently, we expect cross-training the brain to soon become as mainstream as cross-training the body is today, going beyond unstructured mental activity and aiming at maximizing specific brain functions. 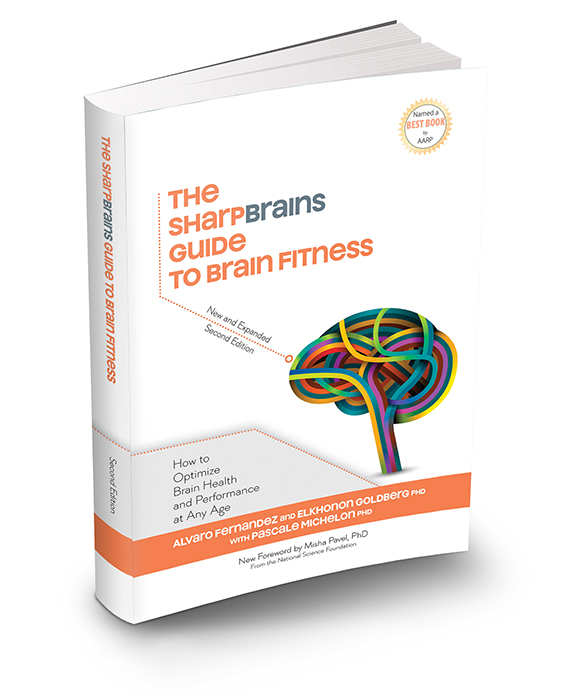 The goal of our new book is to help you navigate the growing landscape of lifestyle and brain training options to enhance brain health and performance across the lifespan. We can define brain training as the structured and efficient use of mental exercises designed to build targeted brain-based networks and capacities. Its aim is to improve specific brain functions, similar to physical conditioning training. Since “neurons that fire together wire together”, repeatedly stimulating (i.e. training) a specific network of neurons results in new and strengthened connections in this network. This in turn translates into improved neuronal efficiency that can result in better and more sustained performance. How is brain training different from mental stimulation? Anything we do involving novelty, variety, and challenge stimulates the brain and can contribute to building capacity and brain reserve. For instance, learning how to play the piano activates a number of brain functions (attention, memory, motor skills, etc. ), which triggers changes in the underlying neuronal networks. Indeed, musicians have larger brain volume in areas that are important for playing an instrument: motor, auditory and visuospatial regions. However, we need to recognize that such an activity may take thousands of hours before paying off in terms of brain fitness. It constitutes a great and pleasurable mental effort, and helps build cognitive reserve, but it is different by nature from more targeted and efficient brain training interventions. To take an analogy from the world of physical fitness, this would be the same as trying to stay fit by playing pickup soccer games (an active leisure activity, certainly better than watching a documentary about soccer) but still putting effort towards training specific muscle groups and capacities such as cardio endurance, abdominal muscles, and thigh muscle. Under what conditions can brain training work? This is the million dollar question. Evidence is growing that brain training can work. The question remains, however, how to maximize the likelihood of transfer from training to daily life. Why do we still often hear that brain training does not work? Because of the different understandings of what “brain training” and “work” mean. A machine to train abdominal muscles probably won’t “work” if what we measure is blood pressure. A “plane” won’t fly if it wasn’t a plane to start with, but a donkey. An important aspect to look at when evaluating whether a brain training method or program works is the extent to which the training effects “transfer” to untrained tasks and to benefits in daily life. We know from common experience that practice usually triggers improvement in the practiced task. For instance, by practicing meditation one can be expected to get better at meditating. The more important requirement is to show that this improvement transfers to other, untrained, tasks, ideally activities performed in everyday life. 1) Training must engage and exercise a core brain-based capacity or neural circuit identified to be relevant to real-life outcomes. Noteworthy examples include executive attention, working memory, speed of processing and emotional regulation, as well as others discussed throughout the interviews with scientists in this book. Many supposed “brain training” games fail to provide any actual “brain training” because they were never really designed to target specific and relevant brain functions. 2) The training must target a performance bottleneck – otherwise it is an exercise in vanity similar to building the largest biceps in town while neglecting the rest of the body. A critical question to ask is: Which brain function do I need to optimize? With physical fitness, effective training begins with a target in mind: Is the goal to train abdominal muscles? Biceps? Cardio capacity? So it goes for brain fitness, where the question becomes: Is the goal to optimize driving-related cognitive skills? Concentration? Memory? Regulating stress and emotions? The choice of a technique or technology should be driven by your goal. For instance, if you need to train your executive functions but use a program designed to enhance speed of processing, you may well conclude that this program does not “work.” But this program may work for somebody whose bottleneck is speed of processing (as often happens in older adults). 3) A minimum “dose” of 15 hours total per targeted brain function, performed over 8 weeks or less, is necessary for real improvement. Training only a few hours across a wide variety of brain functions, such as in the “BBC brain training” experiment, should not be expected to trigger real-world benefits, in the same way that going to the gym a couple times per month and doing an assortment of undirected exercises cannot be expected to result in increased muscle strength and physical fitness. 4) Training must be adaptive to performance, require effortful attention, and increase in difficulty. This is a key advantage of software-based “brain training” over pen-and-paper-based activities. Think about the number of hours you have spent doing crossword or Sudoku puzzles, or mastering any new subject for that matter, in a way that was either too easy for you and became boring or way too difficult and became frustrating. Interactive, automated training has the capacity to constantly monitor your level of performance and adapt accordingly. 5) Over the long-term, the key is continued practice for continued benefits. Just as you wouldn’t expect to derive lifelong benefits from running a few hours this month, and then not exercising ever again, you shouldn’t expect lifelong benefits from a one-time brain training activity. Remember that “cells that fire together wire together” – while the minimum dose described above may act as a threshold to start seeing some benefits, continued practice, either at a reduced number of hours or as a periodic “booster,” is a final condition for transfer to real-world benefits over time. This is an adapted excerpt from The SharpBrains Guide to Brain Fitness: How to Optimize Brain Health and Performance at Any Age” (284 pages; April 2013), co-authored by social entrepreneur Alvaro Fernandez and neuroscientist Dr. Elkhonon Goldberg to cut through the clutter of media hype and confusing research, offering proven, practical tips and techniques that anyone can use to enhance and maintain cognitive, emotional and executive functions throughout life.